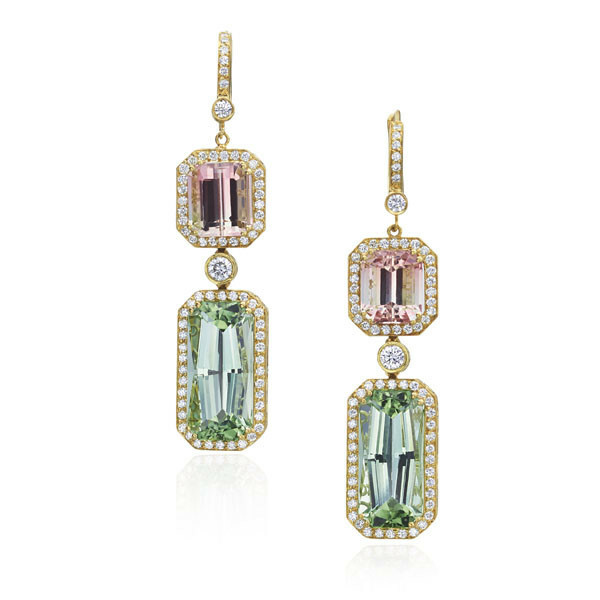 Pleasing pastel tourmaline gemstones and diamonds complement each other perfectly in this posh pair of earrings. Crafted in 18K yellow gold, a line of diamond descend from your earlobe to a bezel-set stone, dropping to a square-shaped pink tourmaline with cut corners enhanced by a diamond halo. This ornament is separated from the rectangular cut-corner green tourmaline with halo below by another bezel-set stone. These shapely drop earrings have a spectacular style.